It’s that time of year. Time to plant those bare root fruit trees, get those spring bulbs into the ground. You can tell that it’s that time of year, because it’s criminally cold out. And under this, I'm wearing long underwear. This is what’s necessary to go out into the front yard. 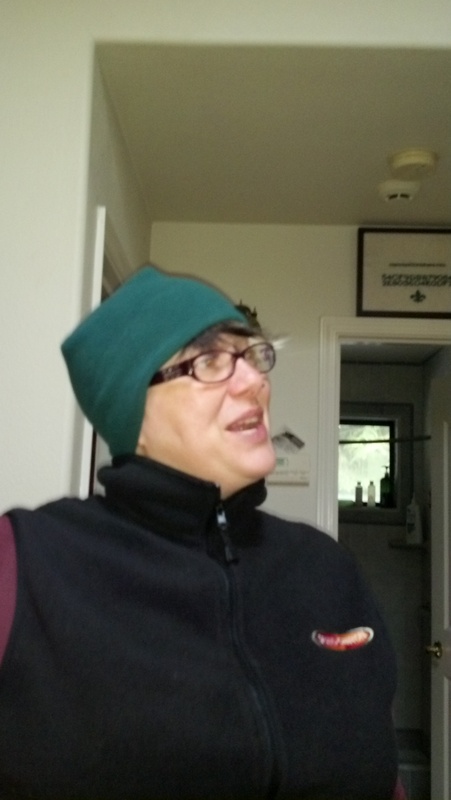 Long sleeves, thermal vest, a hat. I gathered all the potting soil I own, my shovels, my bucket that contains my trowels, pruning shears and gloves, and headed out front. We’ve got two kinds of bulbs. One are the big, double-blooming tulips, the other are the bulbs from the little tiny blue tulips we planted last year. 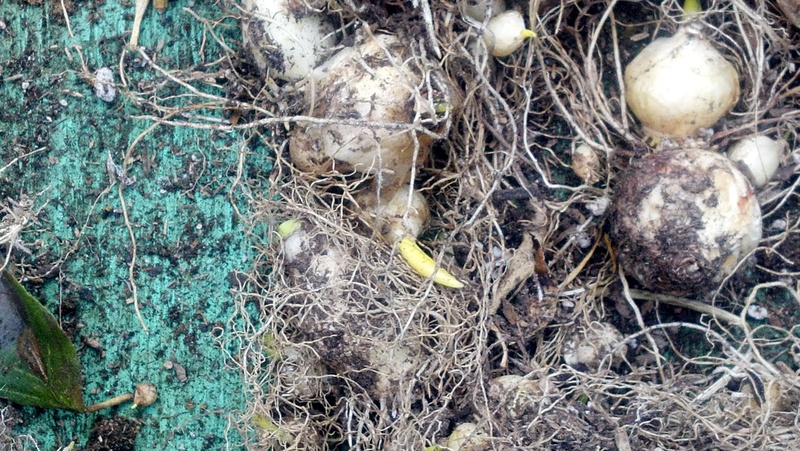 Last year was my first year planting bulbs, and I didn’t realize it, but bulbs sprout other tiny little bulbs in the course of their bulb lives. By the time I dug them up some time in May or June, we had about twice as many as we had originally planted, and a lot of them were teeny little green-onion looking things. The hairy parts are the roots, and some have already started to sprout. When the landscapers were creating the flagstone walkway, they asked us what we were going to do with an old rowboat we got from the Pirate’s mother. I said we were going to throw it out, but the horrified look he gave me let me know that if we didn’t do something with it, he would take it off our hands. He finally persuaded me to plant flowers in it. It’s a tiny little rowboat, built by the Pirate’s uncle to paddle around the canals of Venice, California. It was only ever meant to carry one person, and was small enough for a single man to carry on his back the block or two from his house to the canals, paddle through the canals toward Ballona Creek, carry from the canal to the creek, and then paddle out into Marina del Rey. 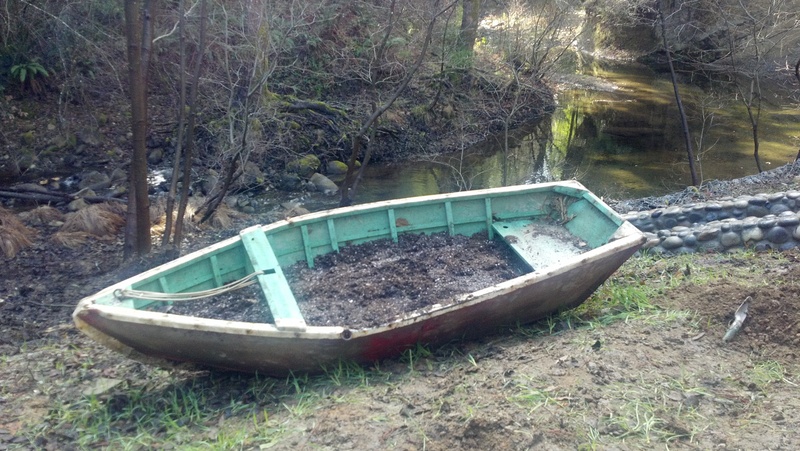 He called the boat “Luff,” and now, over 40 years later, it’s sitting in our side yard, filled with potting soil, compost, loose dirt and flower bulbs. One last thing. You may think to yourself: That’s a lovely sentiment, but how are you going to keep that watered? Aren’t the San Lorenzo valley communities constantly in the middle of some kind of water crisis? Well, that’s where another reminder of the Pirate’s past comes in. This is Cistern Joseph Ann, and she will never whack your knuckles with a ruler. Our 1,100-gallon cistern captures rainwater, which comes from the roof and flows into two 75-gallon rain barrels that then feed into Cistern Joseph Ann, which gives us a total capacity of 1,250 gallons. It takes about 3-4 days of steady rain to fill the entire 1,250-gallon system, which then lasts us about two and a half months of garden watering. Now that the landscaping is done, we’re going to be putting in a vegetable patch on one side of the walkway – a kitchen garden. 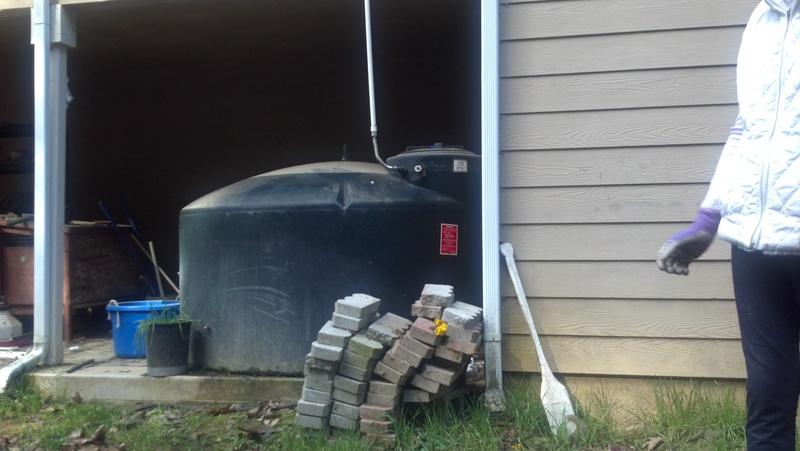 But first, we’re thinking that we might add another 1,100-gallon cistern, nearly doubling our storage capacity. Maybe it can be my turn to immortalize someone important to me, and we can name it after my aunt: Cistern Rosie.